The first Maltese, full feature film for the international market! Clare plays Sharin, the wife of the only Simshar Survivor and mother to Theo, the youngest victim who was sent out to sea on this fatal day. A tragedy which sees Clare playing one of the most challenging and emotional roles yet! Premiered in Malta on the 27th April 2014, Simshar broke all local Cinema records as it ran for over its initial 3 week run. Simshar is a 2014 Maltese drama film directed by Rebecca Cremona. It was selected as the Maltese entry for the Best Foreign Language Film at the 87th Academy Awards, but was not nominated. It was the first time that Malta submitted a film for the Best Foreign Language Oscar. The film tells the story of the Simshar tragedy. During 2015 and 2016, Simshar entered the global festival circuit, collecting several awards including the Special Achievement Award at the International Filmfestival Mannheim-Heidelberg and Best International Feature at Edmonton International Film Festival. In 2015 Gravitas Ventures (US) obtained the worldwide distribution rights for the film including for VOD platforms. Clare represented the Film in some of the Festivals where it won prestigious awards. 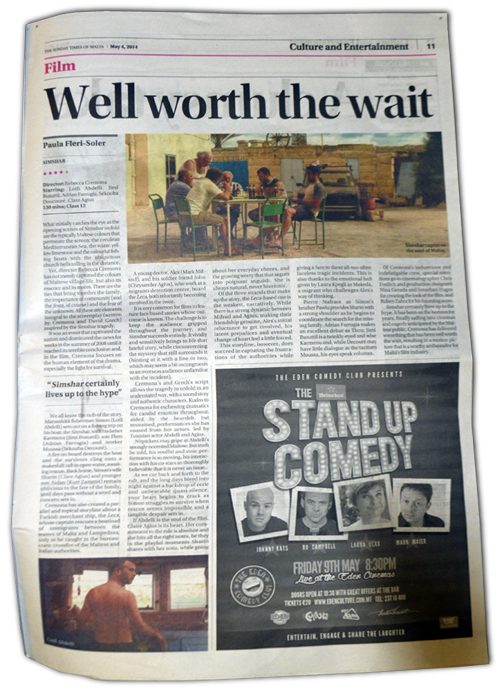 “What initially catches the eye as the opening scenes of Simshar unfold are the typically Maltese colours that permeate the screen…” Read The Sunday Times Film Review here.